Today has been a weird day. I've been motivated about some things and totally unmotivated about others. Motivated to try a new recipe for dinner, but not so motivated to take pictures for today's projects. I should have just taken my camera with me earlier today when I was out and about. I've had a lot on my mind, there is an impending storm and even though I don't have anywhere to be, it means that Butch will stay in town rather than take a chance on us both being stranded up here. I love the solitude and I have Casper, but I think I can see how people could go stir crazy without another human voice around once in a while. 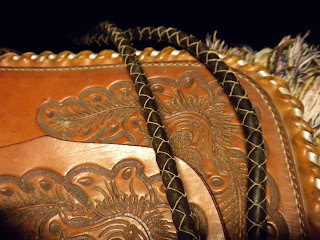 This picture is a close-up of David's saddle. It has been in the house on an old round topped trunk for two years now. It is pretty much just a decoration. I have also been trying to deal with a loss--one of my co-workers died unexpectedly. He was only a few years older than I am, and I don't think he was seeing a doctor for some things he probably should have. He had fallen recently and his arm was still badly swollen, but he wouldn't go see a doctor for that. I have no idea what happened and he was alone at the time. It's just strange, I just can't quite wrap my head around the fact that he won't be there when I get back from vacation. We weren't particularly close or anything, but he always made me laugh and he was smart and well read and he got some of the more subtle humor and I will miss that. Not being there is making me feel somehow removed and the whole thing not really real and I'm not sure why. Another reminder that life is precious people.